The Real Deal‘s editorial team won 13 journalism awards from the National Association of Real Estate Editors this year — a record haul for the publication. “This was genuine journalism of a very high quality that digs beyond the surface,” the judges noted about TRD‘s gold award for best commercial trade magazine. The accolades were announced Friday in Denver at NAREE’s annual conference. TRD reporter E.B. Solomont received NAREE’s platinum award for best individual entry – the top prize of the night – for her investigative feature on the title insurance industry. 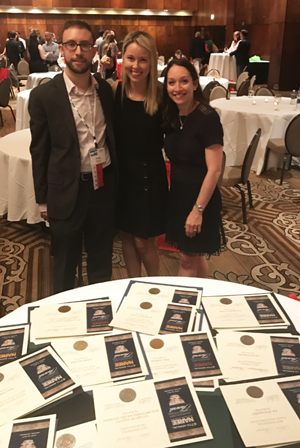 Solomont also took home a silver award for best residential trade magazine story for her attempt to assess the true value of residential brokerages, and a gold award for best team report for her feature with senior national reporter Katherine Clarke on money laundering. Reporter Will Parker won a gold award for best breaking news story and a silver award for the best individual entry by a young journalist for his insider’s guide to evicting rent-stabilized tenants. He also won a bronze award for his story in partnership with ProPublica on why Manhattan luxury developers donate millions to political candidates upstate. (That piece also received a silver award for best team report and, separately, a Deadline Club award.) He took home another bronze for best commercial trade magazine story for his ranking of the city’s largest residential landlords. Associate web editor Mark Maurer received gold awards for a feature on Hasidic Brooklyn’s real estate machers and for a profile of controversial young landlord Raphael Toledano. Clarke also won a silver award for best collection of work by an individual covering commercial real estate for documenting the chaos behind the scenes of the New York Wheel project and a report on how Extell Development’s Gary Barnett is looking to finance his megaprojects. Reporter Konrad Putzier earned a gold award for his investigative feature on the tactics that developers and brokers engaged in to inflate success at their condo projects.